What happens when a company that once focused on selling books online now offers two-hour grocery delivery? Fantastic selection and service. Amazon is eating the world, and because of that, you get to eat the groceries they ship faster than ever. There isn’t a bigger player in the grocery delivery game. Amazon Fresh offers one of the widest selections of grocery deliveries, with unbeatable speed (under two hours), and great customer service. In other words, if you’re a fan of their site for ordering everything else, why not try their grocery delivery service? Of course, as with any Amazon product, the interface can take a little getting used to. But once the order is complete, it’s pure magic watching how fast groceries arrive at your door. Amazon has one of the most amazing logistics systems in the world, and it applies just as well to their food delivery. Compared to many services as well, Amazon Fresh has the widest available reach of almost all services. It doesn’t really matter too much where you live, it’s likely that Amazon Fresh will make the deliveries. One interesting alternative that we’ve also seen growing is the ability to go pick up the groceries from Amazon Fresh “stores” – Pull up, and have all your groceries loaded straight into your car. Definitely a handy service, one that we have seen several other major grocery chains starting to clone. It seems likely that it’s only a matter of time before we’ll see Amazon delivering our groceries through the air by drone, or jet packs, or some new technological advancement that we haven’t even thought of yet. 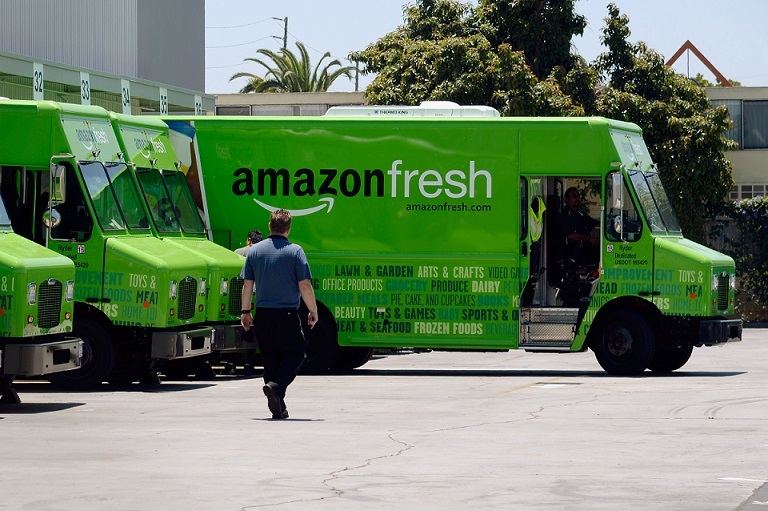 That’s another fun benefit of Amazon Fresh, that we’re certain they’ll remain competitive among all other grocery delivery services. How does Amazon Fresh work? If you’re already an Amazon Prime member, you can check out their Amazon Fresh service here. Login or create an Amazon account (you don’t have to be a Prime member, but it’s worth it). Select your groceries like you’re shopping on the Amazon website for just about anything. Wait for the groceries to deliver in their famous green bags (chilled too!). Set up recurring orders for the things you order most commonly. Do we recommend Amazon Fresh: Yes!